Enjoy your stay at Far Hills Country Hotel where you can truly relax and unwind in a peaceful environment. With the magnificent panorama of the Outeniqua Mountains this country establishment on the Garden Route is aptly called Far Hills Country Hotel. This Garden Route hotel has managed to combine the grand style of days gone by to modern, comfortable amenities. Take a load off and enjoy the relaxing ambience that this Garden Route hotel exudes. Guests who step into the baronial-style entrance of this Garden Route hotel will find a comfortable lounge complete with antiques and large windows that overlook stunning scenery. 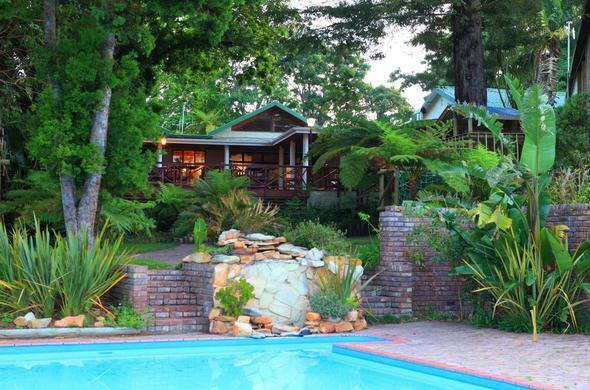 The area that this Garden Route hotel is situated in is known for its diversity of flora and fauna. Stare in awe at the beauty of the ancient mountains, deep gorges, natural forest and the untamed seas. Come to this area of South Africa that has earned the name Garden Route and enjoy your stay at Far Hills Country Hotel, a truly stunning Garden Route hotel.